Coalition against Iranian-backed Houthis announces five-day humanitarian ceasefire. The Saudi-led coalition in Yemen has announced a five-day humanitarian ceasefire in its strikes on Houthi jihadists, according to Saudi Arabian state news. The ceasefire will begin tomorrow (Sunday) at 11:59 pm local time. 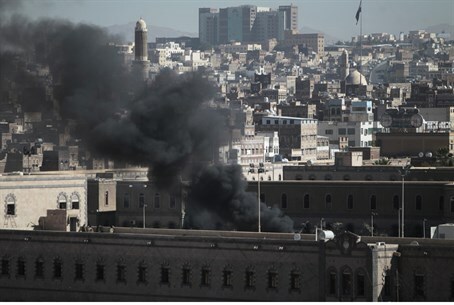 The coalition has been supporting exiled President Abd-Rabbu Mansour Hadi by carrying out airstrikes against the Iranian-backed Houthis since March 26. Over 3,200 people have been killed in the past four months and it is believed that another 13 million are in desperate need of food and medical aid. Local sources say that a coalition strike on the central city of Taiz killed at least 80 people. Another ceasefire was attempted earlier this month, but collapsed within a day. Once again Saudi Arabia has warned that it will respond to any violations of the ceasefire. Both Human Rights Watch and Amnesty International have stated that the coalition uses banned weapons and takes little to no precautions in order to avoid civilian casualties. Despite this, the United Nations Security Council has not made any statement on the conflict stronger than to express its "deep concern." Furthermore, there have been no mass protests throughout Europe, no calls to boycott Saudi oil or academics, and no attempted flotillas to assist Yemenis.